Nashville songstress Dolly Parton is making a bid to get back to the big screen with hip hop heavy Queen Latifah. The duo have signed on to a movie project titled "Joyful Noise," the Hollywood Reporterwrites. In the film, the two female vocalists will team up to keep a small town gospel choir afloat. Parton, 54, has not been in a feature film since the 1992 movie "Straight Talk." In recent months she has been working on her musical, "9 to 5," and just celebrated the 25th anniversary of her Tenessee theme park, Dollyworld. 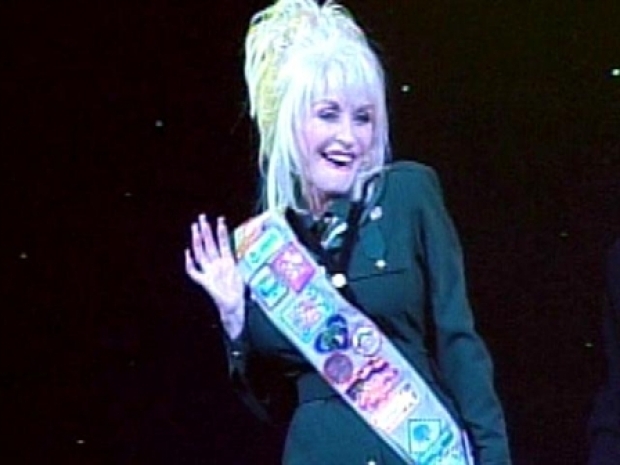 A year and a half ago country music legend Dolly Parton took fulfilled her childhood dream of becoming a Girl Scout. That theme park attracted headlines when a trio of Florida teenagers purchased plane tickets without their parents knowledge and tried to fly their for a visit. The film leaves open the possibility for country-crooner Parton and R & B mogul Latifah to sing together on screen. The film will be directed by Todd Graff, who worked on the 2003 movie-musical "Camp" and more recently, "Bandslam."